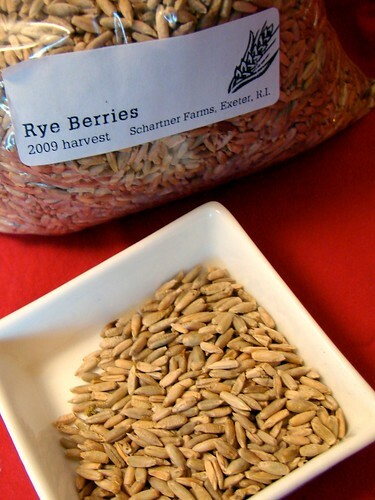 As soon as I heard that Schartner Farms was going to have rye berries at our Wintertime Farmers’ Market, I began looking into ways to use them. My first thought was to substitute them for farro in things like warm grain salads, a preparation that has worked extremely well. But when I was trying to decide what to whip up for our dinner last night, I had another thought: as I’ve mentioned here before, I’d love to get a solid, tasty vegetarian chili recipe in my repertoire, and with portions of cooked beans and cooked rye berries already in the fridge, it seemed like a good thing to revisit. From a textural standpoint, the rye berries did everything I hoped they would in the chili (and the beans, of course, were fabulous). However, the finished dish was lacking the sort of meaty-without-meat flavor I was after. I think for the next go-round, I’ll return to my original idea of adding mushrooms into the mix to provide savoriness and yet another textural variation, but I’ll definitely keep the rye berries in. Look for my recipe soon. 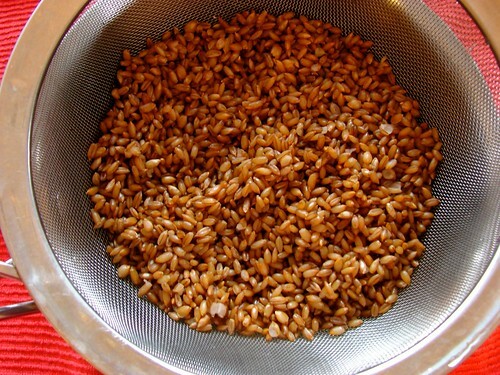 I’ve passed by those wheat berries week after week, wondering what to do with them. I’ve even stopped, picked up the package, but then put it back on the table. Thank you for the inspiration — I was thinking only about grinding the berries, not using them whole. I’m going to go take a look through some of my whole-grain cookbooks, to see if I can find a recipe that will let me justify the purchase of the rye berries at the farmers market tomorrow. In Almost Meatless (my cookbook) I have a recipe for chili that involves peanut butter. It truly does give it a meaty, rich mouthfeel without meat. And it doesn’t taste peanutbuttery. I’m e-mail it to you. Jen, how do they compare to barley, taste and texture-wise? Ann – I hope you try and enjoy them! Do let me know what you come up with! Marie – They’re not so similar to pearled barley, which is what I generally buy. I think as far as both texture goes, the rye berries are very similar to farro, with a pleasant, chewy bite and a very nutty flavor.